Philadelphia Phillies’ Chase Utley is seen during a baseball game against the Washington Nationals, Friday, April 10, 2015, in Philadelphia. This early in the baseball season, most hitting statistics are worthless. Numbers like on-base percentage and slugging percentage — the core components of a hitter’s value — mean little in samples as small as 100 plate appearances. Without the usual tools, baseball columnists have to turn to other, more reliable (but offbeat) stats. Last week it was catchers’ pitch framing. This week: it’s how much a guy can punish a ball. Until recently, hard hits were the kind of thing you could see but not always quantify. Fortunately, Statcast has come to the rescue. The new camera tracking technology, installed in all Major League Baseball ballparks in 2015, isn’t just about dissecting defense. It also offers an unparalleled view of hitting. Its cameras track a ball’s speed as it leaves the bat, allowing us to see when a hitter makes good and bad contact. It’s good to smoke the ball. All else being equal, pitches that are struck harder tend to become hits more often1 and are more likely to fall for extra-base hits. Even so, some hitters have managed to escape their expected OPS. Either they have been the beneficiaries of good luck, or they’ve found some way to perform that doesn’t depend on hitting the ball hard. In most cases, we should expect their OPS to come back to what it should be, given how well they hit the ball. Let’s take a look at some of the players who are outperforming their velocities the most. Dee Gordon stands out on the list of overachievers.3 This analysis isn’t quite fair to Gordon, because we aren’t taking into account running speed, and that’s Gordon’s calling card. Gordon’s legs turn lightly struck grounders into hits and stretch singles into doubles. They allow him to make the most of his otherwise mediocre defense and fringe bat. Even so, we shouldn’t expect Gordon to keep up this kind of OPS. His current batted ball velocity is 10th-worst among the 225 regulars I examined, placing him in some poor company: the likes of Alberto Callaspo (OPS of .640), Omar Infante (.633), and Marlins teammate Ichiro Suzuki (.660).4 Most of the hitters with batted ball velocity as low as Gordon’s have substantially worse performance than him, suggesting that Dee Gordon’s speed is uniquely effective or that he’s in line for some regression. Both statements are probably true to some extent: Gordon has thrived on speed for as long as he’s been in the majors, but this is a new and unsustainable level. But just as Gordon has exceeded all expectations, others have fallen behind. 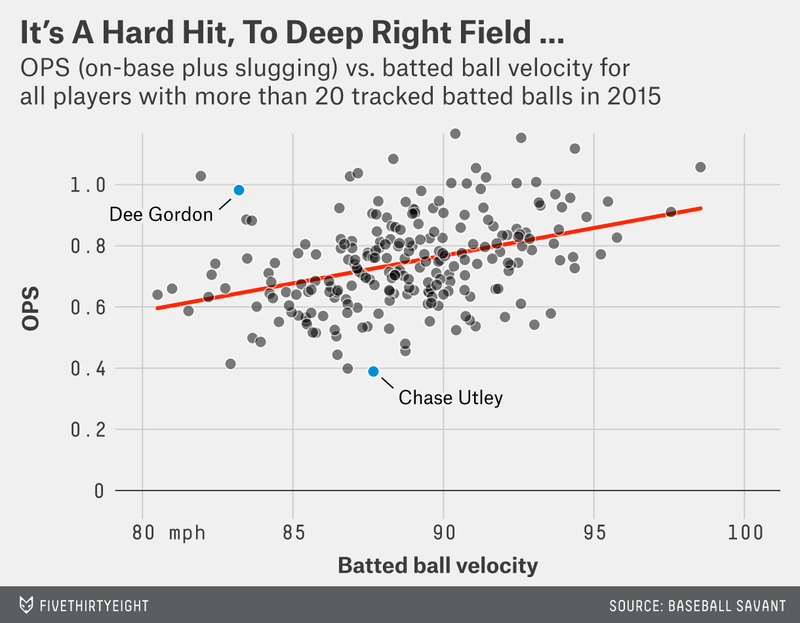 Meet Chase Utley, the unluckiest man in baseball. The Phillies second baseman is cursed with a .115 batting average on balls in play (BABIP), meaning that about a tenth of the balls he puts on the field get him safely to base. An average BABIP mark is about .300, and while there is some variation between players, it’s usually on the order of a few dozen points, not 200. Utley’s Statcast readings present an interesting contradiction with other kinds of batted ball data. Others have noticed that Utley might be hitting fewer line drives and making weaker contact, but these analyses rely on guys in the stands who manually diagnose each batted ball. These manual data collection efforts have proven error-prone in the past. In contrast, the batted ball velocity data comes from automated camera tracking. The technology is still young, and undoubtedly there are hidden problems to be worked out. Already, Jeff Sullivan has noted that some batted balls have been assigned implausible velocities, indicating that we need to take these numbers with a grain of salt. It’s possible, too, that hitters’ batted ball velocity will regress to meet their OPSs, instead of their OPSs regressing to what we’d expect given their hit velocity. In Utley, we have a player whose Statcast data doesn’t match the conventional narrative. If the commentators and traditional data sources are correct, Utley is headed toward a premature retirement. If Statcast is right, Utley has an about average bat, one that should recover. The Phillies just have to stick by him long enough to let him do it. Preliminarily, it appears that batted ball velocity tends to stabilize much more quickly than the traditional offensive numbers. Velocity reaches a correlation of 0.7 with itself in as few as 15 batted balls. With an R2 value of 0.1475, this is a significant relationship. Gordon’s excellence extends to FanGraph’s wins above replacement metric, where he’s first. Numbers current as of the writing of this article.